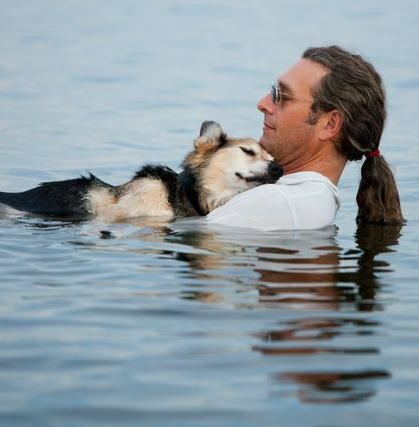 A powerful photo of John Unger’s arthritic 19-year-old dog, Schoep, being cradled in his father’s arms in the warm waters of Lake Superior led to unsolicited donations from people who wanted to help pay for the dog’s care. Before the photo swept across the web, John was considering euthanasia because he didn’t have the money to pay extensive veterinary bills. The resulting $25,000 collected from caring strangers is now paying for weekly laser treatments and glucosomine supplements and pain medication that has Schoep wagging his tail once again. John Unger, 49, has also started a charity, The Schoep Legacy Foundation, to help other low-income families care for their aging dogs. All thanks to a photo taken by a professional photographer and friend of John’s who specializes in capturing relationships on film. True love knows no bounds. Bless you and your beloved Schoep, Mr. Unger!